Simplify your NDIS management by taking advantage of the iplanit and easyemployer integration. A revolution in best practice client and employee management, this combination offers a powerful, easy to use and affordable system that will address multiple complex areas in your business. 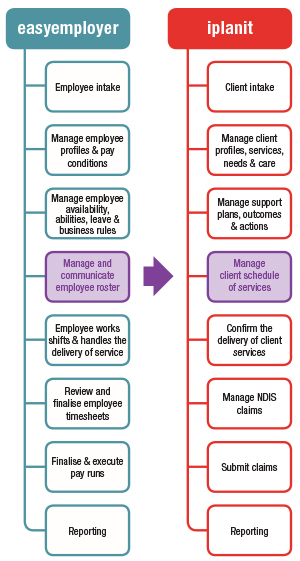 The innovative iplanit & easyemployer combination will drive efficiencies in your organisation in these key NDIS operational areas: staff and client management, NDIS outcome tracking, staff costs, NDIS funding, client schedules, staff rosters, payroll automation and NDIS portal integration. The combined iplanit/easyemployer solution will provide a level of streamlining and automation that can greatly assist your organisation. easyemployer is an easy to use, flexible and powerful workforce management solution. easyemployer is assisting service providers clients to streamline and automate staff administrative tasks – cutting up to 90% of time spent and saving up to 15% of weekly payroll costs. iplanit is an easy to use, highly configurable client management system. Don’t lose sight of your clients in the rush to be efficient, use iplanit to support the achievement of outcomes.